UTP and STP Cable installation, measurement, maintenance or inspection. greatly simplifies telephone line installation and maintenance. · Self implement T568A, T568B, 10Base-T and Token Ring cables testing. · UTP and STP co-axial cable testing. · Network integrity and configuration examination. · Open/ shorts circuit, miss wiring, reversals, and split pairs testing. · Cable open/short point tracing. 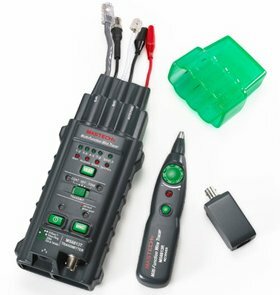 · Receive audio signals in the network or telephone cable. · Transmitting signal to target network and tracing cable direction.